Cricut EasyPress 2. Learn answers to the most commonly asked questions about the Cricut EasyPress 2 and how it compares to standard irons and heat presses. For those of you who are long-time readers, it is no secret I love my Cricut. I started with the Cricut Expression and cartridges and moved all the way up to the new Maker machine. Not only does Cricut continue to excel at creating the best electronic die cutting machines, but they have also outdone themselves with new technology to use with your Cricut machine. Today, I am going to be sharing answers to some frequently asked questions about the Cricut EasyPress 2. This post contains affiliate links. If you purchase something through the link, I may receive a small commission at no extra charge to you. Please read my full disclosure policy here. Thank you to Cricut for sponsoring this post and providing me with product. First of all, what is the Cricut EasyPress 2? The EasyPress machines combine the speed of a heat press and the convenience of an iron. It is the perfect crafting addition to your Cricut machine if you want to use iron-on (sometimes called heat transfer vinyl) to create t-shirts, embellished accessories, and more! To get professional looking results when using iron-on materials, you need to make sure you are applying even heat to your project. You also need a hard, stable surface, and some pressure. Both heat presses and the EasyPress 2 machine can heat up to 400° F, have edge-to-edge even heating, are steam free, plus have temperature and timer controls to let you know exactly how long to press your project. Size and weight: Heat presses are often large and bulky. If you have a small crafting space, this may not be the best option for you. The EasyPress 2 is lightweight and portable, so you can take it with you wherever you craft. Versatility of base materials: A heat press only allows you to press flat items, like t-shirts, or bags. The EasyPress 2 has the versatility to work on a variety of materials in varying thicknesses that are not flat such as hats, home decor items, and more. Safety: Heat presses often require dedicated power outlets to avoid tripping circuits. They stay hot for a long time and don’t usually have an auto-off feature. The EasyPress 2 has a safety base to protect your work surface, an auto shut-off feature, and does not require a dedicated power outlet. Speed: Heat presses were designed for commercial use. They take longer to heat up, but once heated they allow you to quickly heat press the same project over and over again to create multiples in minutes. The EasyPress heats up quickly, so you can finish your project in minutes. A heat press may be the correct choice for you if you are creating items for commercial use, but most home crafters will prefer the ease and versatility of the EasyPress 2. In fact, when my iron broke, I didn’t replace it. I only used it for crafting and the EasyPress 2 is perfect for my needs. Size matters when it comes to working with iron-on and heat. A heat plate that is too big will be awkward to use on smaller projects like onesies and hats, and may not evenly press over the seams. If your heat plate is too small, on larger projects you may need to use multiple passes and could potentially ruin your iron-on material by over processing it. First, you need to figure out the types of iron-on projects you are going to create most often. Is it t-shirts for the family, baby clothes, bags, or blankets? This is the smallest of the EasyPress 2 sizes. The small size is perfect for little projects like baby clothes, scarves, napkins, shoes, make-up bags, and small sewing projects. It is lightweight, portable, and easy to maneuver around cumbersome seams. The medium size is a great everyday machine. It is still small enough to be portable and easy to use, but large enough to allow you to iron-on many designs with just one pass. Projects that this machine is good for are things like smaller t-shirts, bags, aprons, table runners, and costumes. This big EasyPress 2 is perfect for your largest projects. It allows you to iron-on your entire design in just one pass on most projects like larger t-shirt designs, sleeves, banners, blankets, and adult clothing. When determining which size EasyPress 2 you purchase, be sure to take into account the work surface you will be using. You want a firm, flat, and solid surface that is heat resistant. You can project your surface by using one of the EasyPress mats. There are three sizes that pair with each of the different EasyPress 2 machines. Choose a mat that is the same size or larger than the EasyPress machine you purchase. 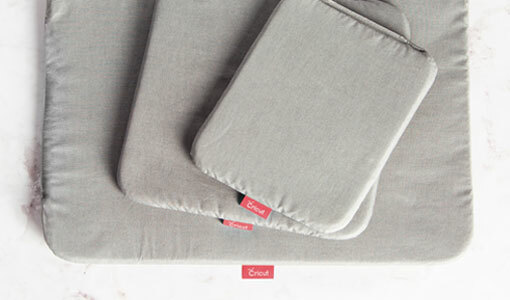 The mats contain five layers of heat-resistant, moisture-wicking insulation to create foolproof iron-on results. *The mats are sold separately from the EasyPress machine. Your EasyPress 2 comes with a Quick Reference Guide to easily determine what settings to use for your project. Choose your iron-on material and base layer, and you will know the exact temperature and time required to complete your project. The guide also tells you whether to do a warm or cold peel – meaning you remove the protective backing material while the project is still warm or once it has completely cooled. Cricut also has an amazing EasyPress Interactive Quick Reference Guide: https://home.cricut.com/easypress-heat-settings-guide. This guide allows you to choose your materials and surface from a drop-down menu. It will automatically tell you what settings to use with your EasyPress 2. It takes away all the guesswork. Helpful Tip: When working with different iron-on materials, always start with the iron-on type that requires the higher temperature and the longest time. You can purchase an iron-on protective sheet to use with your EasyPress 2. It is 12″ x 12″ and protects your iron-on projects from damaging heat plus it distributes heat evenly for secure adhesion. It can be used with all Cricut iron-on materials. I use the protective sheet on most projects, but it is especially helpful when you are layering iron-on on a project. After you add the first layer, you can peel off the protective backing and place your next layer. Use the protective sheet to protect the iron-on you have already applied. What is the difference between different Cricut iron-on materials? Everyday iron-on is versatile and easy to use. If you are just starting out, this is one of the easiest materials to work with. It comes in over 28 different colors. It works great as a base layer and you can iron-on any other type of heat transfer material over it. Plus, it is very easy to weed your design with this material. This is the material you want to use if your base layer has stretch. Think work out clothing, knits, and swimwear. It comes with Cricut’s StrongBond Guarantee. StrongBond Guarantee means that when a specific iron-on material is used as directed, you’ll be completely satisfied with the results. If not, Cricut will replace it for free. Look for the StrongBond Guarantee on select iron-on materials. This iron-on is just plain fun. Instead of a solid color, this iron-on material comes with a pattern. You can see how I used it to create a really beautiful floral t-shirt design. The patterned iron-on works really well to jazz up a plain text project with minimal effort. Glitter iron-on is my favorite to use. Who doesn’t love a little extra sparkle? It works so well to add some dimension when used with the Everyday iron-on. It is so popular you can even buy it in bulk. However, it can be tricky and frustrating to weed, so using the BrightPad really helps! You can’t iron-on other materials over glitter. Using the slice tool with your design allows you to create a layered look without actual layers. Foil iron-on is becoming a close runner up to the glitter iron-on for me. I love using it on home decor projects. It still has shine but is more subtle than the glitter iron-on. The holographic iron-on is almost like color changing glitter iron-on. The colors shift as you look at your project from different directions. It works so well for projects that are so trendy right now – mermaids and unicorns! It doesn’t get any easier than this! The designs are pre-printed for you to craft with right out the package. You don’t even need a Cricut machine to use them. There are so many options to choose from. I created a reverse canvas using one of the designs. It was such a quick and easy home decor project! I hope this answered a lot of your questions about the EasyPress 2. If you have any additional questions please leave them in the comments. Which easy press would be okay to use when you are doing quilting/patchwork? You can use any EasyPress 2 machine for quilting/patchwork. I think unless you are working on very large projects, the smallest 6″ x 7″ would work the best for your needs. Hope that helps!